Here’s a 12 hour data run showing the noise pickup on a 1.0 m diameter helmholtz coil in my lab. I wanted to see how much noise exists in the my laboratory. Looks to my eye to be about mV peak-peak fluctuation. No obvious temperature correlation (at least crudely, but I’ll check it out for real). Next step will be to measure the fluctuations while a “constant-current” power supply is driving the coils. Of course, I suspect that the noise has a large 60 Hz content, but I could only get the LabJack interface to sample at about 20 Hz. I was using the LabJack python interface API, so it may be possible to achieve a higher rate if I look into lower level calls. Fortunately, this high frequency noise will not affect our pendulum, as it’s period is significantly lower (on the order of 0.6 Hz). The plot was made with qtiPlot, as Matplotlib could not plot the data array, which consisted of about 1 million data points. The error that python returned to me indicated that the error occurred in the Agg backend, but I haven’t tried other backends, and haven’t checked if this is a numpy issue. 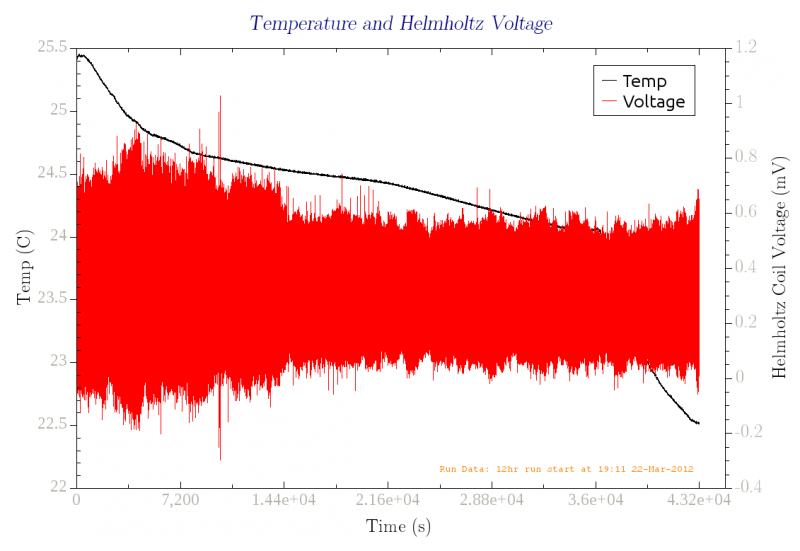 Voltage Fluctuations through Helmholtz coil when connected to LabJack input.